It’s all galleries this week- not a bad way to escape the heat! 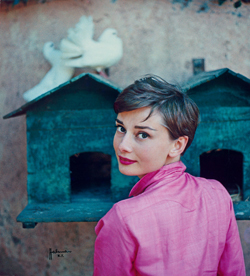 • Thirty-five photographs of late actor Audrey Hepburn from the personal collection of her sons form the centrepiece of a new exhibition at the National Portrait Gallery. Audrey Hepburn: Portraits of an Icon, which opens today and is the first UK exhibition to be organised with the Audrey Hepburn Estate, explores the life and career of the celebrated film star. Among the images lent by her sons Sean Hepburn Ferrer and Luca Dotti are a portrait of the actor performing a dance recital at the age of 13 in 1942, a photograph of her taken while filming The Nun’s Story in Africa in 1958, and a behind-the-scenes photograph of Hepburn during a costume fitting for the 1954 film Sabrina. Other images in the display include those taken during the shooting of numerous films ranging from 1955’s War and Peace to 1967’s Two for the Road as well as vintage magazine covers. Runs until 18th October. Admission charge applies. For more, see www.npg.org.uk/hepburn. PICTURE: Audrey Hepburn by Philippe Halsman for LIFE magazine, 1954. © Philipe Halsman/Magnum Photos. • The works of Barbara Hepworth, one of the UK’s greatest artists, are on show at the Tate Britain on Millbank. Barbara Hepworth: Sculpture for a Modern World features more than 100 works, from major carvings and bronzes to less familiar pieces. Juxtaposed with works of other great artists – including paintings, prints and drawings of her second husband Ben Nicholson, they include her earliest surviving carvings, her more purely abstract works of the late 1930s, wooden sculptures made while Hepworth lived in Cornwall in the mid-1940s and four large carvings made in the mid-1950s in African hardwood guarea which, reunited for this exhibition, arguably represent the highpoint of her carving career. There are also bronzes from her 1965 retrospective at the Kroller-Muller Museum. Runs until 25th October. Admission charge applies. For more, see www.tate.org.uk. • American artist Joseph Cornell’s art is the subject of an exhibition at the Royal Academy of Arts in Piccadilly which opens on Saturday. Joseph Cornell: Wanderlust, organised in conjunction with Kunsthistoriches Museum in Vienna, features about 80 of the artist’s box constructions, assemblages, collages and films including rarely seen masterpieces lent from public and private collections in the US, Europe and Japan. Arranged in four sections, the display features works from his major series including Museums, Aviaries, Soap Bubble Sets, Palaces, Medici Slot Machines, Hotels and Dovecotes. Runs until 27th September. Admission charge applies. For more, see www.royalacademy.org.uk. • Send all items for inclusion to exploringlondon@gmail.com.